One of my favorite childhood memories is singing “Blueberry Hill” with my friend Diana on a little rise (it couldn’t be called a hill!) on the Forest Service Ranger Station in Bly, Oregon where we lived as pre-schoolers. 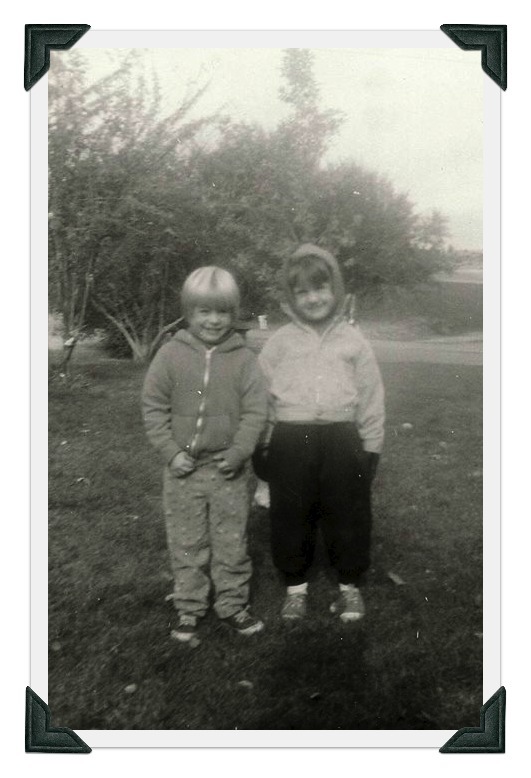 Diana (Barrick) and me, both sporting pixies back in the 60s, Bly, Oregon. Our fathers both worked for the Forest Service and our families lived in adjacent stone houses. A stonewall lined the front of the compound, a grove of trees graced the middle of the property, and an old lookout tower stood at the far end. I, along with my older sisters and brother and the other kids who lived on the ranger station definitely experienced a free-range childhood. We played outside all day long whenever we could, only coming in for meals. We played Island of the Blue Dolphin, World War II, spaceship, and lots of other “games.” Our family didn’t have a TV so my siblings and I would either sneak over to the house of a family that did or else, on stormy days, we would work on projects or we would read. It was an absolutely idyllic childhood. I learned to both use my imagination and to enter into the imaginations of others in a cooperative effort. My siblings: Kathy (Fink), Kelvin (Egger), and Laurie (Snyder); our Aunt Dori (Sprague); Diana (Barrick); and me (with the white headband). I was aware and fond of the parents of our friends on the ranger station, but my siblings and the other kids were my world. I don’t remember knowing or caring what the adults’ jobs were or their political beliefs or their religions. We just wanted to play and be left alone as much as possible. I thought of those days of childhood as I wrote my latest novel, Amish Promises. In the story, a military family moves next door to an Amish family. The grownups all have concerns about each other and conflicts develop, but the children immediately bond and just want to be allowed to play in their imaginary world along the creek between the two houses. Children live in the moment and don’t dwell on differences between each other like adults do—nor do they realize the impact those friendships will have throughout their lives. All these years later, Diana and I are still close friends and although we live 300 miles apart, we stay in touch online and see each other when we can. I’m very grateful for the experiences and friends from my childhood, and I’d love to hear about yours! 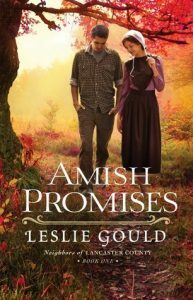 Leave a comment below to win a copy of Amish Promises. Tell me where you grew up, about your siblings, or about one of your friends—or anything else you’d like to share. @lesliejeangould shares the impact of an idyllic childhood & the chance to win #AmishPromises! 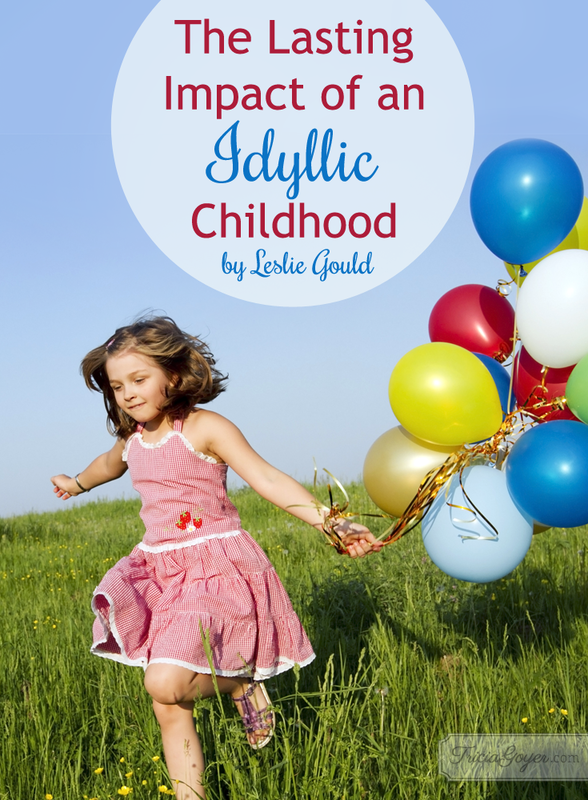 Leslie Gould is the #1 bestselling and Christy Award winning author of twenty novels. She enjoys Church history, Shakespeare, and traveling. Leslie and her husband, Peter, live in Portland, Oregon and are the revolving-door parents of four children and three cats. Visit her at www.lesliegould.com. My only sibling a brother died 4 years ago but we had a great childhood with out paternal grandparents in there summer home in maine. I had four brothers and four sisters. We learned to work, share and get alone and attended and volunteered at church. My father was in the Air Force. We lived in Italy for 4 years when I was in elementary school. Then we came back to Homestead AFB for a few years. The friendships I had made through the AF never seemed to last once their families were transferred elsewhere. I would write and write and eventually give up when I wouldn’t get replies. Then the base was destroyed by Hurricane Andrew. That one was tough as there wasn’t much warning and due to the damage, we had to move so quickly we never got to say goodbye to any of our church friends or neighbors. 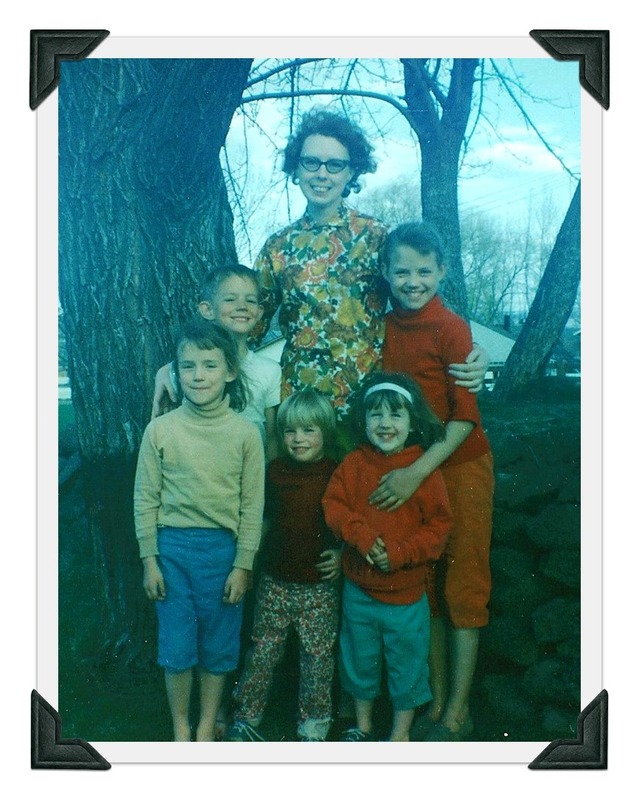 But I was fortunate that I had 5 siblings – they were my closest friends. I can’t imagine what life would have been like without them. I love that you acted out the books you were reading! Such great imaginations. My kids used to act out The Boxcar Children too. Wow I just read the comment of the person above me-we were ALSO stationed by the Air Force in Italy during my childhood! I actually do have a few of the same friends I did growing up, but I know it was hard to maintain those friendships-thankful that it was a priority for my parents as well! lol – cool coincidence! (And in real life I go by Kat – how’s that for coincidence? 😉 Though for some odd reason, my dad was stationed on an Army post in Italy – Camp Darby. I loved it there, though we learned so many years ago that none of us are ever allowed to donate blood. Unless they develop a test for vCJD in humans that could be used to screen blood donors and to protect the blood supply anyway. When I was a little we would go to the cottage on the weekends by wood lake and I loved to here the motor boats on the lake taking the the men to there favorite spots to catch there limit of fish for the day and bring in and fry up and I still can remember that wonderful smell of my mama’s fresh fried fish. Thank you for sharing this memory! So fun! What great memories, Sharon. Thank you so much for sharing them! I had two younger sisters and we grew up in a neighborhood with lots of children. We all played together and loved to ride bikes, play tag, hopscotch – anything you could do outdoors. Miss those days! I have two older sisters–we played for hours and hours too. Always lots and lots of imaginative stuff. Thank you for sharing your childhood memories. I was born and raised I Plainfield, NJ. I had a great big yard and I loved to give talent shoes. There was mostly the the neighborhood kids and my brother. I was the director. We had shows for our parents and who ever wanted to come. Winter time we went sleigh riding down the hills in the local park. What a great childhood you had! I love that you were the director of the talent shows and wonder how that influenced your life as an adult. I grew up in Shawnee and Tecumseh, OK, and had 1 half brother and 2 younger sisters. We had a wonderful childhood. Our family would practically live at the national park in the summertime, camping out, swimming, hiking, and just being outside and being with each other. As a child, my family moved often never living anywhere more than a year or two. One year we moved three times. I learned how to make quick friends but it wasn’t until 9th grade when I made a friend that we have been able to keep some contact over the years. My cousins at extended family, gatherings became the long life friends for me. One of my earliest memories with one of my favorite cousins was playing at her home. We used to cut paper dolls out of the old Sears catalog and make families. Most of our moves were in the mid-west, Kansas, Texas, Missouri but as a teenager moved to Idaho. I agree that cousins make great life-long friends. I love your memory of cutting paper dolls out of old catalogs. I used to do that at my grandparents home. I would love to win a copy of this book! I grew up a military brat, so my brother has been my longest and best friend. We grew up pretty poor but didn’t know it! We grew up playing in mud, staying outside, reading together, coloring with our mom. It was a really great, gentle childhood! It sounds as if you had a wonderful childhood! Thank you for sharing about it! I grew up with no siblings so I was lonely. I have a friend I made in high school that I keep in touch with online. My children don’t get lonely since I have a dozen of them. I would absolutely love to read a copy of this.